So, who was this man whose feast we celebrate today? A Peripatetic Philosopher… asked me for money. For this reason I left him, believing him to be no philosopher at all…. I came to a Pythagorean Philosopher, very celebrated – a man who thought much of his own wisdom… He said, ‘What then? Are you acquainted with music, astronomy, and geometry?’ Having commended many of these branches of learning, and telling me that they were necessary, he dismissed me. Unfortunately, most of St. Justin’s works are lost. 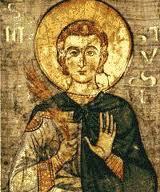 St. Justin Martyr, pray for us!